Dig out your tweed flatcap or pencil skirt, trim that moustache and enter the spirit of yesteryear from the comfort/discomfort of an old bike. 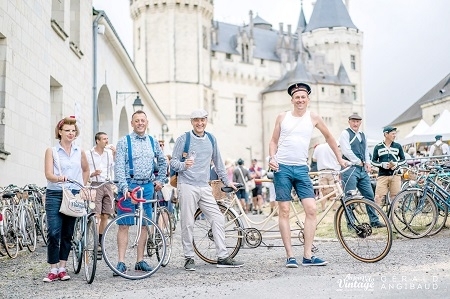 The annual Vélo Vintage festival based in Saumur is primarily a low-key, gentle cycling event through the marvellous Anjou landscape, and has routes ranging from 30 to 120kilometres to suit all levels of fitness and speed. Beyond bikes, it is a celebration of all things vintage, with stalls selling vinyl, live music, local traditional specialities and a glass of fizzy Saumur wine. A great day out for friends and family: book a bike and register now. This year, the Annecy International Animation Film Festival received over 3,070 films (short and feature films, TV and commissioned films and graduation films) from all over the world, and from them more than 200 have been shortlisted to take part in the official selection. While filmmakers and animators are here in a professional capacity, to find funding, meet musical composers, etc, the public can attend screening events, including sneak previews of shorts and features. See website for details.